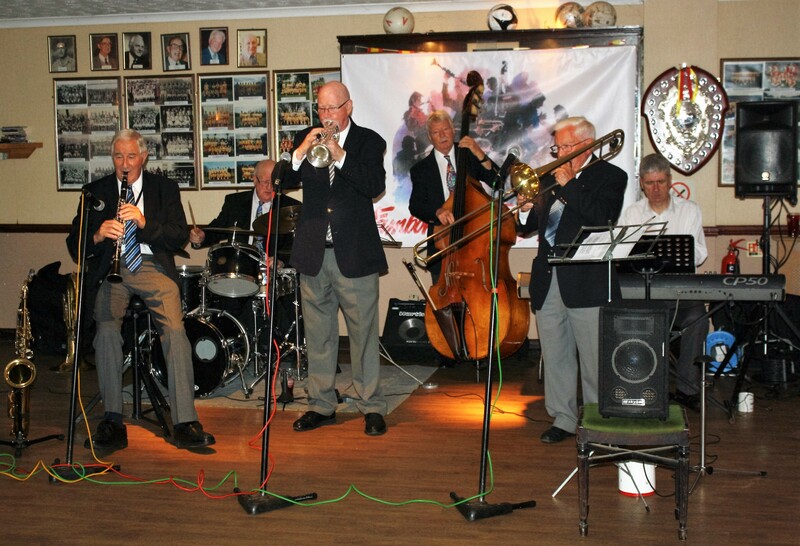 PHOENIX DIXIELAND JAZZ BAND were on top form at Farnborough Jazz Club on Friday 19th August 2016. 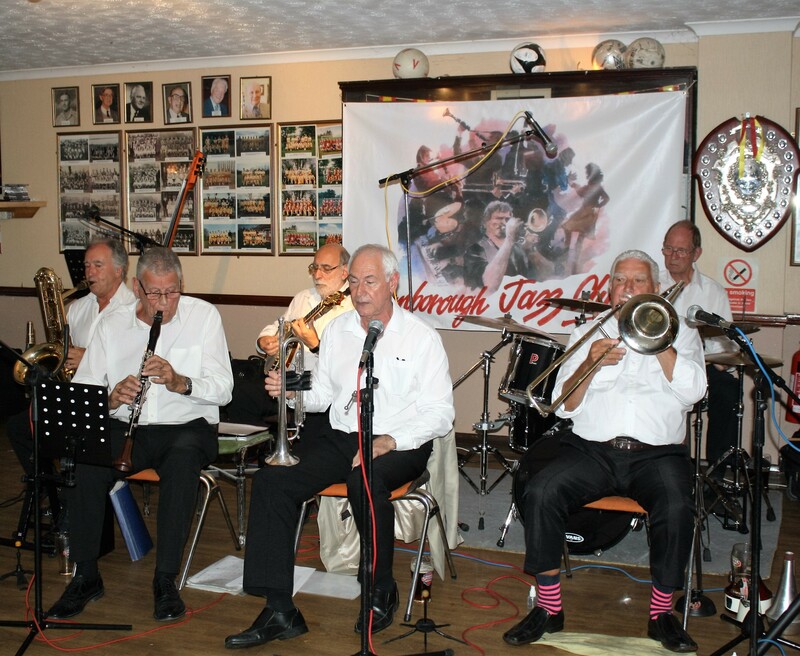 They’re a wonderful 7-pce band who certainly know how to make an evening really sparkle. 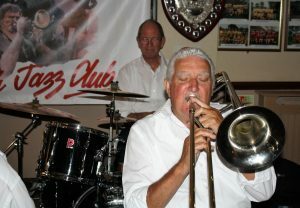 Although we love and missed Paul Higgs on trumpet, it was a fantastic surprise to have MIKE BARRY take over on trumpet. He seemed to play better than ever, perhaps being relaxed, not having to run his own bands (with an ‘s’). So here are the super musicians we had playing here, giving us a brilliant evening. 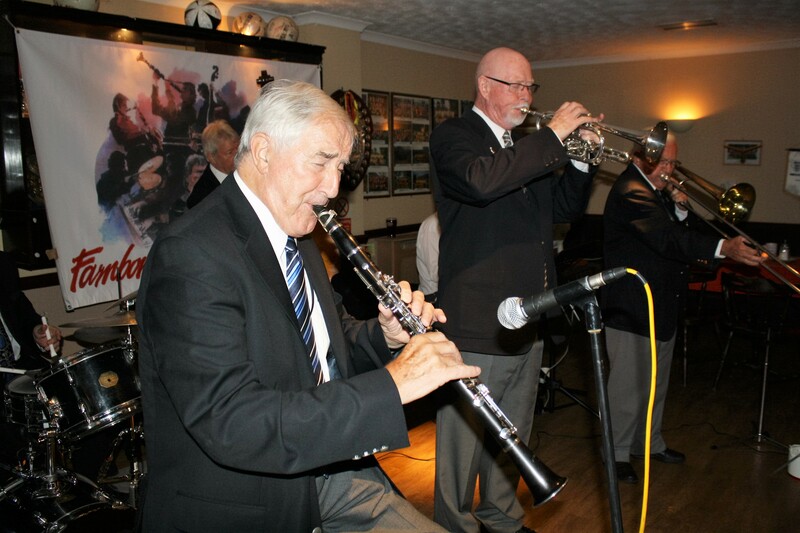 As already mentioned, we had MIKE BARRY on trumpet, plus CHARLES SHERWOOD on clarinet, BILL TODD on trombone, ALAN CLARKE on drums, DAVE BARNES on piano, ROGER CURPHEY on double bass and JOHN STUART on banjo & guitar. I know I always say it, but again, what a wonderful evening of fun jazz. 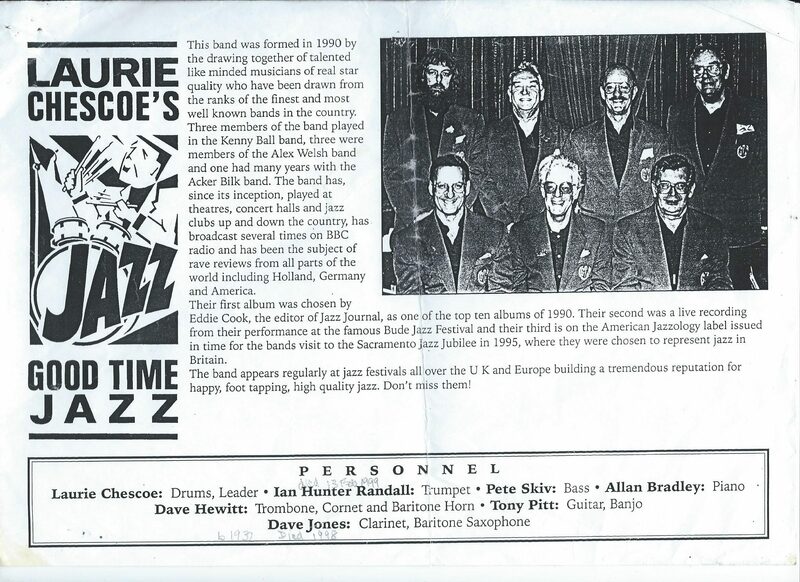 ‘At The Jazz Band Ball’ was their starter for ten. Everyone taking brilliant solos – certainly a great number to greet people arriving with. Two people who had arrived out of the blue, were the lovely dancing couple, Linda and John, who travel, I believer from Hastings to get to us, got up to the very next number, ‘Dr Jazz’, what a great beginning, with the band giving wonderful solos everywhere again. 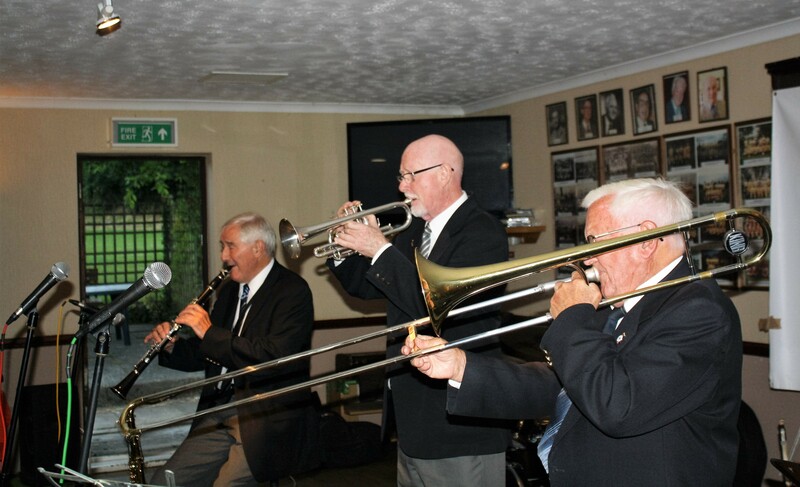 ‘Front liners’ for Phoenix Dixieland Jazz Band. 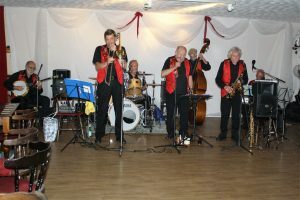 Seen here at Farnborough Jazz Club on 19th August 2016. 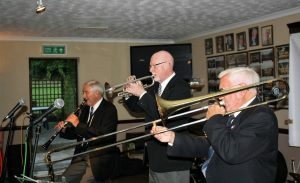 (LtoR) Bill Todd (trombone), Mike Barry (trumpet) and Charles Sherwood (tenor sax ), plus Roger Curphey (double bass). Photo by Mike Witt. 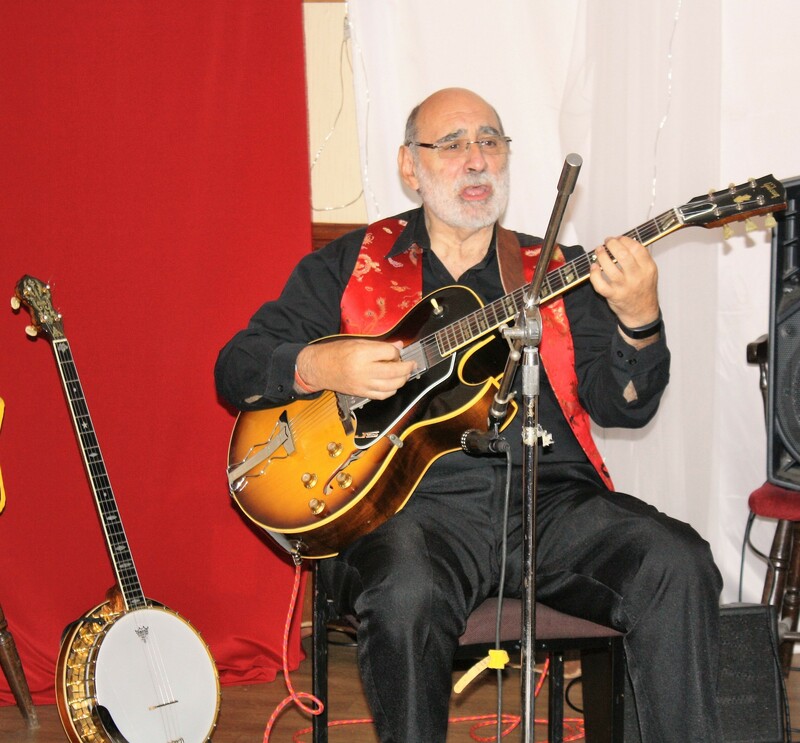 John Stuart, playing guitar for Phoenix Dixieland Jazz Band at Farnborough Jazz Club on 19th August 2016. Photo by Mike Witt. 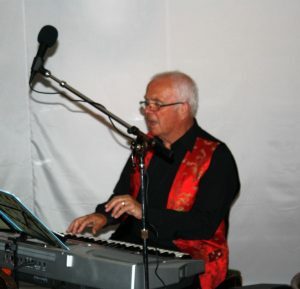 My next choice to relate to you was their lovely version of ‘Chinatown, My Chinatown’, with their fantastic Chinese intimations (the only thing missing for me was ‘Ying tong, Ying tong’ etc,) – great drum solo from Alan. Then Bill sang ‘Rockin’ Chair’. I do love that Hoagy Carmichael song. Then it was Dave’s turn to sing and he chose to do ‘I Can’t Give You Anything But Love Baby’, with the ‘front line’ singing ‘Shuby Duby’, ha. Wow did they boom out the next number brilliantly too – ‘That’s A Plenty’. Where do they get their energies from? 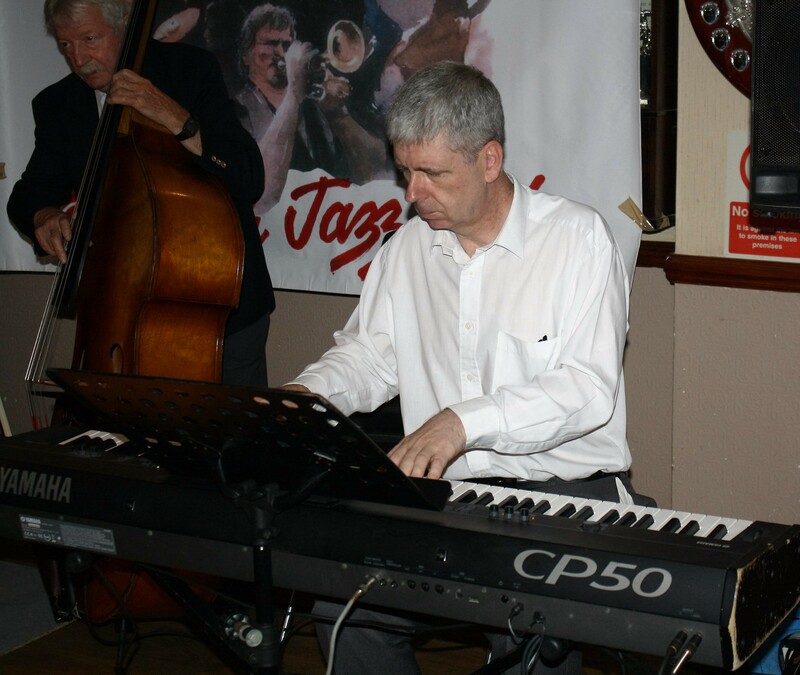 Dave Barnes seen here playing piano for Phoenix Dixieland Jazz Band at Farnborough Jazz Club on Friday, 19th August 2016. Photo by Mike Witt. Charles Sherwood seen here featured playing clarinet to ‘Petite Fleur’, with Dave Barnes on piano for Phoenix Dixieland Jazz Band at Farnborough Jazz Club on Friday, 19th August 2016. Photo by Mike Witt. 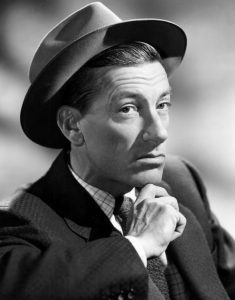 The tune that followed was a feature one for Charles, who excelled himself with ‘Petite Fleur’. 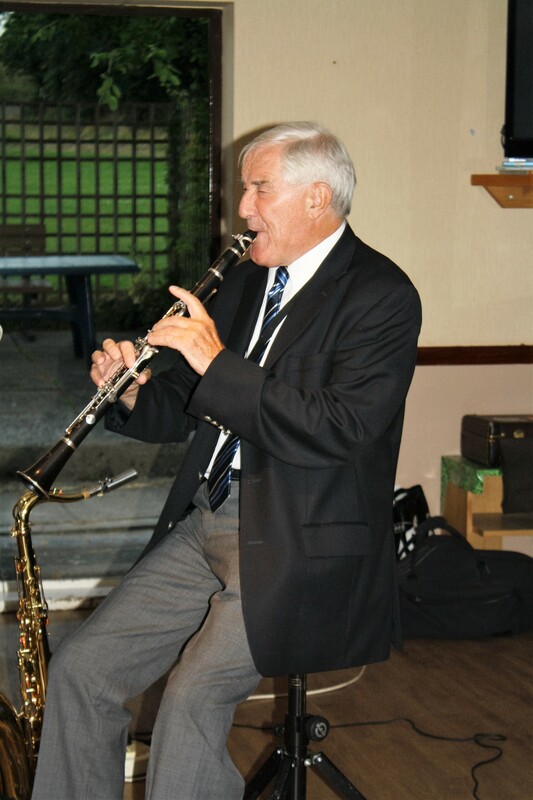 He has mastered his clarinet to a beautiful level, so a joy to listen to. The next number that I love, ‘Someday, You’ll Be Sorry’ is one that Keith and I sing to one-another (a lot) in unison (for obvious reasons, so have to mention it) ha. Plus their last one was ‘Bourbon Street Parade’, Oh yeah. Wonderful! Another lovely dancing great. 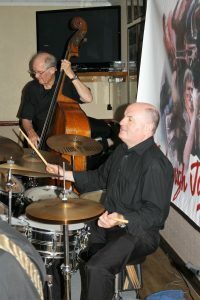 So if you missed the evening … and many of you did, due to your holidays (yuk – all coming back rusty looking), this is what you missed … Mike was great with these guys, being so relaxed and obviously old muckers too. Anyway, hopefully we will see you all back soon. 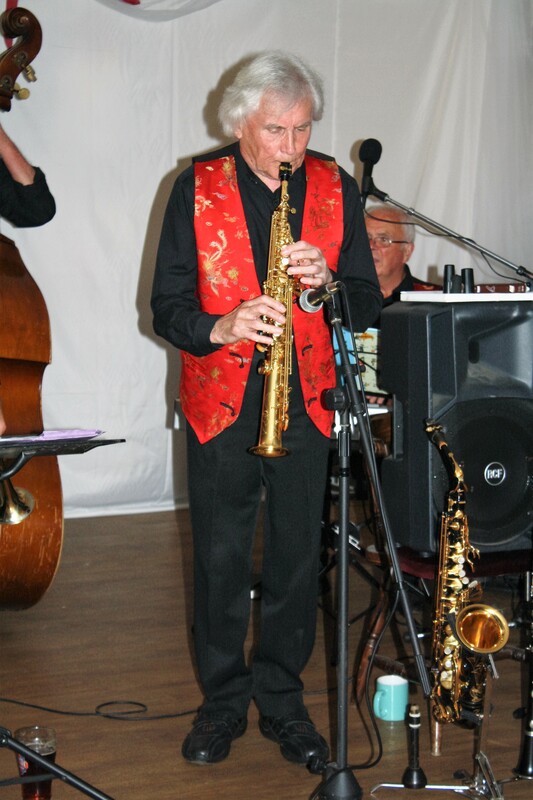 Bill Todd takes a solo for Phoenix Dixieland Jazz Band at Farnborough Jazz Club on Friday, 19th August 2016. 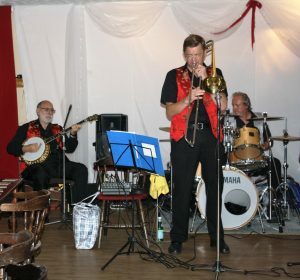 (LtoR) John Stuart (banjo), Bill Todd (trombone) and Alan Clarke (drums). Photo by Mike Witt. Charles Sherwood again, but this time, on tenor sax, with Dave Barnes on piano, playing for Phoenix Dixieland Jazz Band at Farnborough Jazz Club on Friday, 19th August 2016. Photo by Mike Witt. 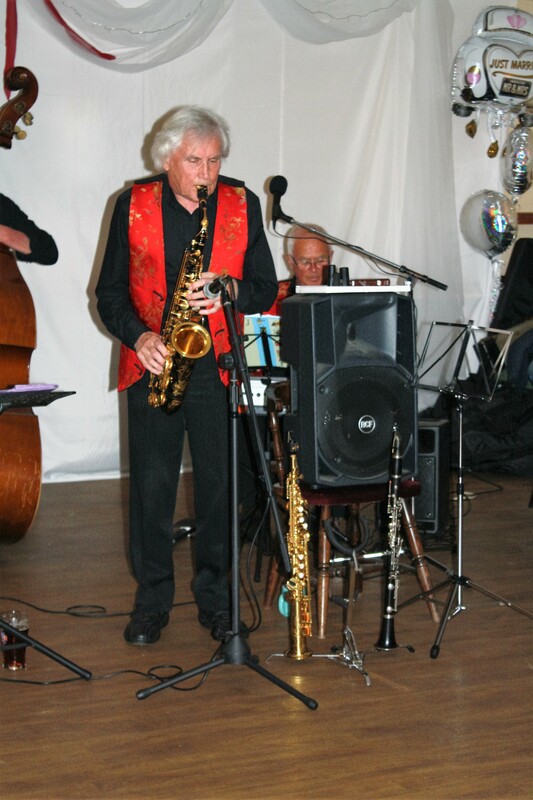 Here’s Charles Sherwood playing alto sax for Phoenix Dixieland Jazz Band at Farnborough Jazz Club on Friday, 19th August 2016. Photo by Mike Witt. This entry was posted in Phoenix Dixieland Jazz Band on August 18, 2016 by Diane. 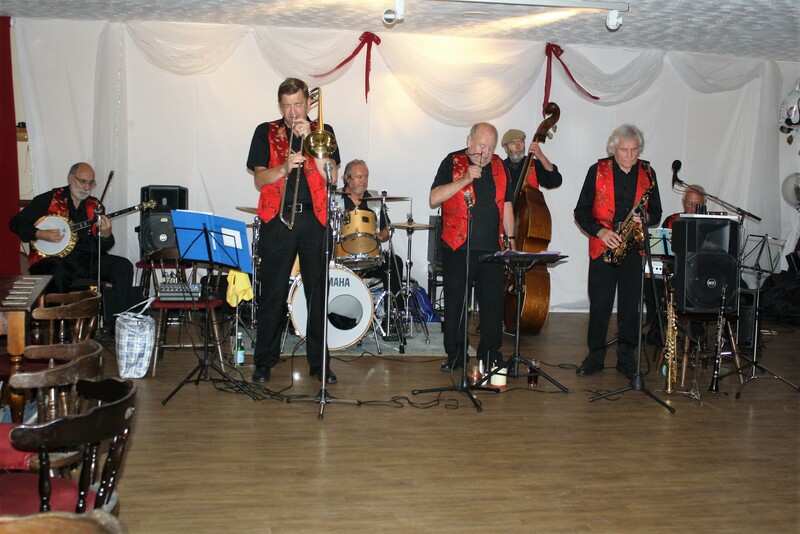 TONY PITT’S ALL STARS came to help us celebrate Keith birthday, here at FARNBOROUGH JAZZ CLUB (Kent) on FRIDAY, 12th August 2016. We were celebrating with a capitol C, as always. Band leader (and banjoist) TONY had manage to get those fabulous stars (well Tony is –an extra special musician), ALAN GRESTY on trumpet &vocals, DAVE HEWITT on trombone, AL NICHOLLS on soprano & tenor sax, ANDY LAWRENCE on double bass and JOHN ELLMER on drums. What more can I say, but with these fantastic musicians, I told you to expect some humongous fun and that we did! 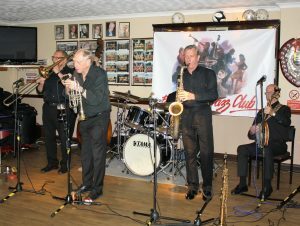 Tony Pitt’s All Stars came to Farnborough Jazz Club for Keith’s birthday on 12th August 2016. 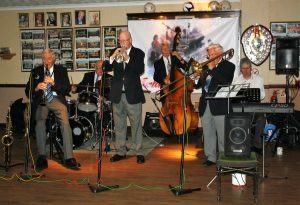 (LtoR) Dave Hewitt (trombone), (hidden) Andy Lawrence (double bass), Alan Gresty (trumpet), (hidden) John Ellmer (drums), Al Nichols (tenor sax) and Tony Pitt (banjo). Photo by Mike Witt. With so many photos, I have put them all at the end of the write-up this time. 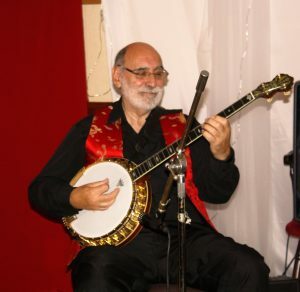 Now about their first tune, it was ‘Mama’s Gone, Goodbye’ and what a tremendous job they did, especially Al, being it was the first time he had played it – what a pro’ aye. 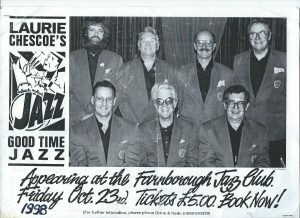 Then came ‘Blues My Naughty Sweetie’ and did they give it their all (I recall Tony played a fabulous solo), especially as it was a hot night). 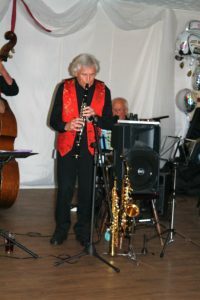 This was followed on with ‘Pennies From Heaven’ and brought on all the dancers – well, it was very hot evening and this was such a lovely slow number. I believe Alan sang, although we had so many friends arriving for Keith’s birthday and hadn’t written it down. Now, my next choice was ‘Carry Me Back to Ol’ Virginie’. (I recall Tony saying Alan had requested this number be played.) We did our line-dance to this, although not ideal, plus I had my ankle ‘go’ on me, so had a hard job, but we enjoyed it. 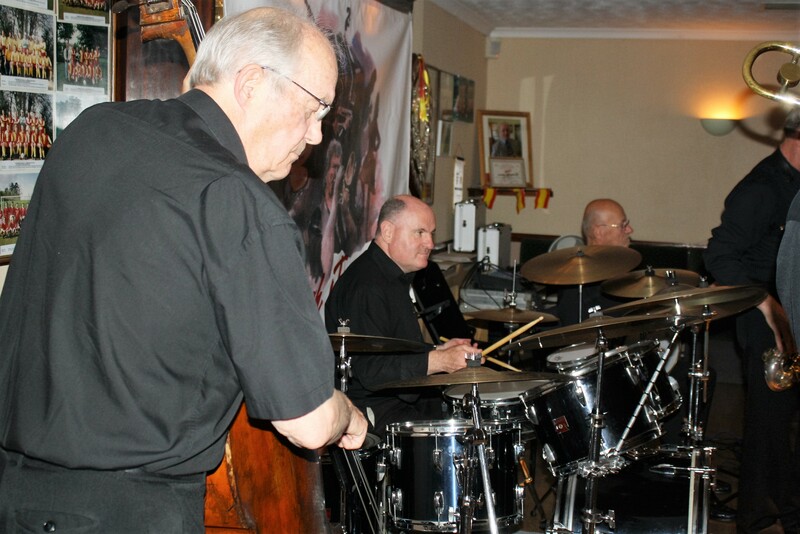 John was brilliant with a great drum solo intro to ‘Hindustan’, a fabulous favourite with so many trad bands. Next, Tony made an announcement, telling us the next number was dedicated especially to Keith. It was ‘When I Grow Too Old To Dream’. Yes, everyone had a laugh at that. 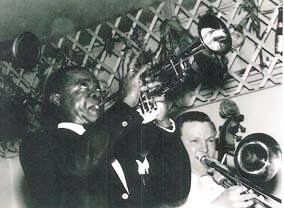 Another tune to mention (written by Lovie Austin, a famous 1920’s band leader ranked alongside Lil Harding Armstrong) was ‘Traveling Blues’. 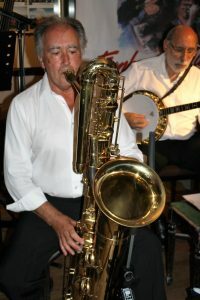 Al played super tenor sax. I was so fed up I couldn’t dance, it is such a great one to dance to. 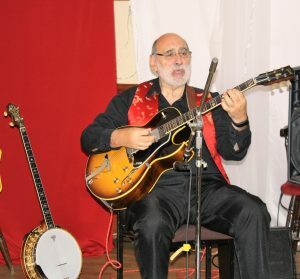 Oh, I must mention ‘Saint Louis Blues’, what a great jazz song and I put several ticks – to make sure I’d mention it. Wow, they were all excellent, playing – all of them, I mean! Great trumpet, fabulous tenor sax, super trombone (Tony, you surely can pick ‘erm – musicians aye). Keith got me up to dance, pretty impossible really with my ankle keep ‘giving way’ on me, but Keith ended up dancing a duo with John’s drum solo. Keith is actually doing his own form of tap dancing (he had impossible shoes on too), but being a drummer, he is wonderful with his footwork. Everyone thought he was brilliant – the band thought he might have a heart attack at any moment – ha. (I haven’t told Keith yet, but my son-in-law (Scott) filmed this and hopefully it will look as good as it did on the night. Scott promised to get it to me soon and I shall put it here for you to see,) Their last number was ‘Blue, Turning Grey Over You’, which is Tony’s theme song. Keith joined me on the dance floor – awhh, how romantic again. You must put Tony’s next date here in your diaries, being Friday, 28th October 2016. Please leave your comments on it as to what you think! The band were superb. 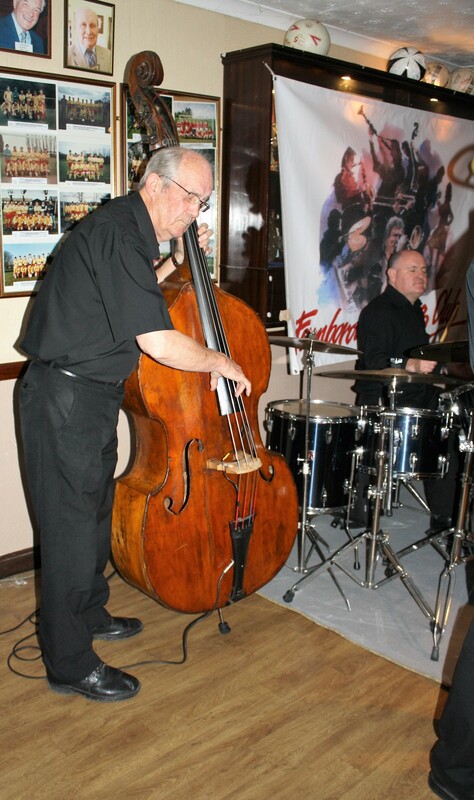 Andy Lawrence on double bass and John Ellmer on drums of Tony Pitt’s All Stars at Farnborough Jazz Club, playing for Keith’s birthday on 12th August 2016. Photo by Mike Witt. Andy Lawrence plays double bass and John Ellmer plays drums for Tony Pitt’s All Stars at Farnborough Jazz Club for Keith’s birthday on 12th August 2016. Photo by Mike Witt. 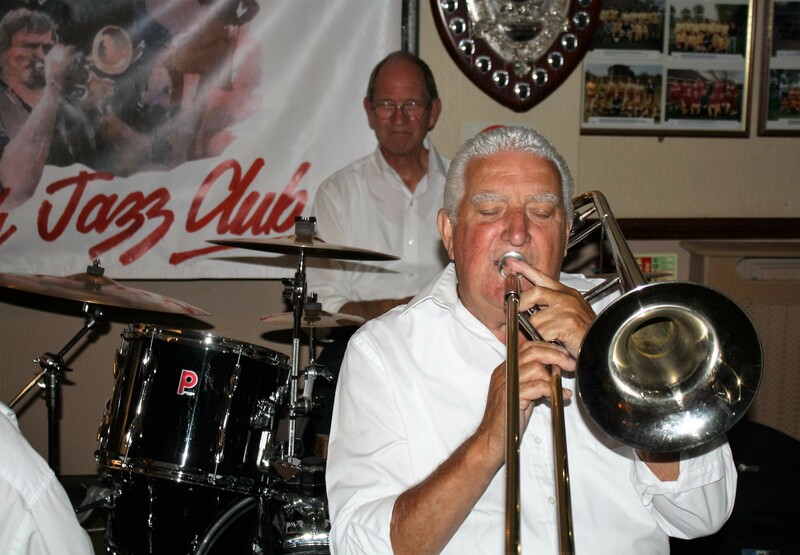 Dave Hewitt plays trombone, with Alan Gresty on trumpet and Al Nichols on tenor sax, front line of Tony Pitt’s All Stars, seen here at Farnborough Jazz Club for Keith’s birthday on 12th August 2016. Photo by Mike Witt. The ‘Engine’ of Tony Pitt’s All Stars play for Keith Grant’s birthday (co-promoter of Farnborough Jazz Club) on 12th August 2016. (LtoR) Andy Lawrence (double bass), John Ellmer (drums) & Tony Pitt (banjo). Photo by Mike Witt (also a b’day boy). 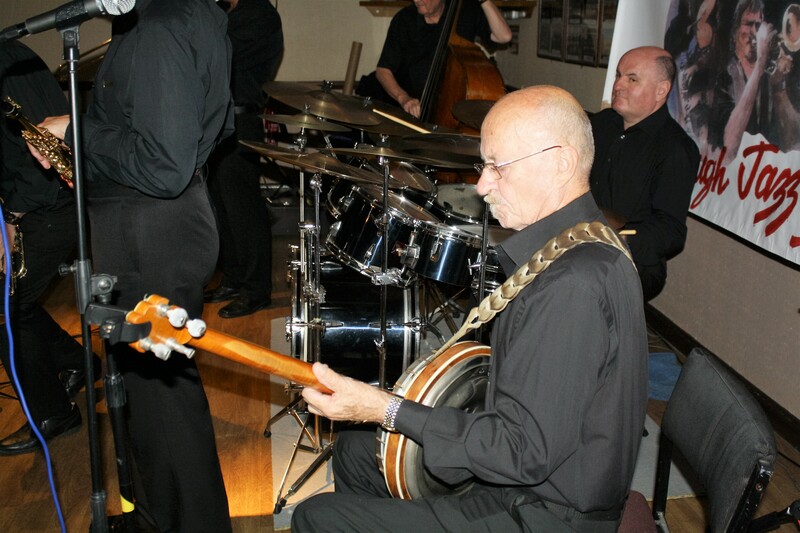 Tony Pitt plays banjo with his own ‘Tony Pitt’s All Stars and John Ellmer on drums, They were here at Farnborough Jazz Club for Keith’s birthday on 12th August 2016. Photo by Mike Witt. 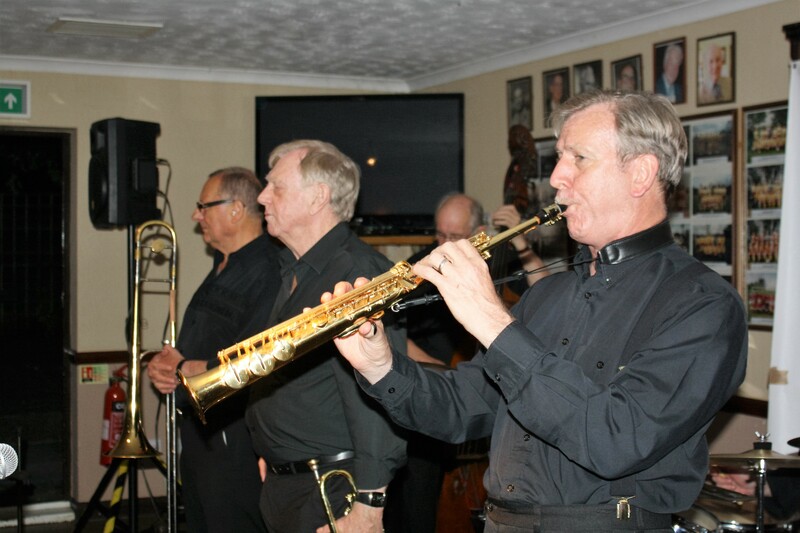 Front line of Tony Pitt’s All Stars Jazz Band, playing for co-promoter, Keith Grant’s birthday at Farnborough Jazz Club on 12th August 2016. 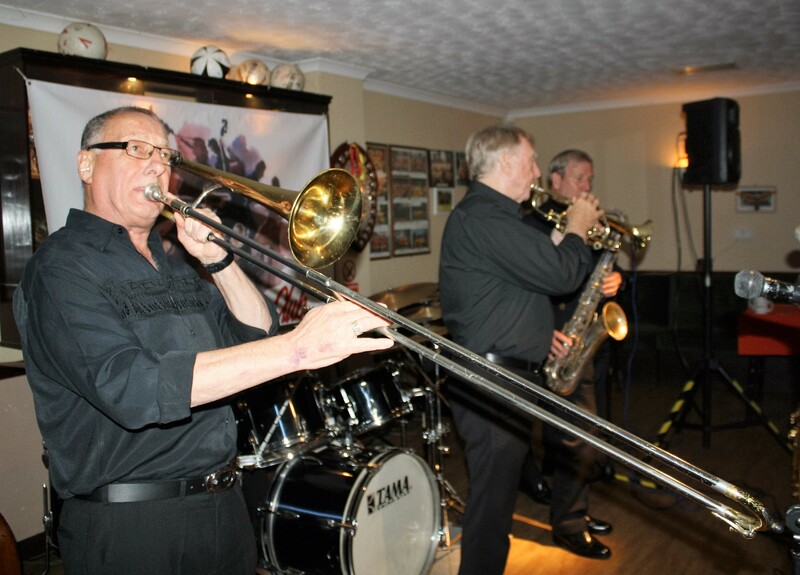 (LtoR) Dave Hewitt (trombone), Alan Gresty (trumpet), Al Nichols (soprano sax) plus Andy Lawrence behind (d.bass). Photo by Mike Witt (also a b’day boy). 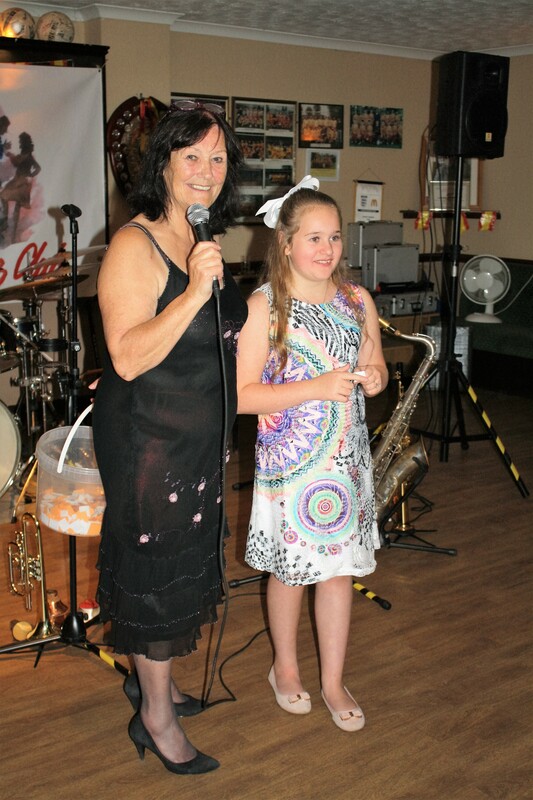 My granddaughter Zianna, joins me with the raffle draw at Farnborough Jazz Club with Tony Pitt’s All Stars on Keith’s birthday, 12th August 2016. Photo by Mike Witt (also a b’day boy). This entry was posted in Tony Pitt's All Stars on August 15, 2016 by Diane. We had a good turn-out for the ‘LORD NAPIER HOT SHOTS’, who entertained us here at FARNBOROUGH JAZZ CLUB on Friday 29th July 2016. The boys in the band were band leader MIKE JACKSON on trumpet &vocals, MIKE DUCKWORTH on trombone, PAT GLOVER on reeds &vocals, JOHN STUART on banjo & guitar, MICK SCRIVEN on double bass, bass sax &vocals, plus BILL TRAXLER on drums. 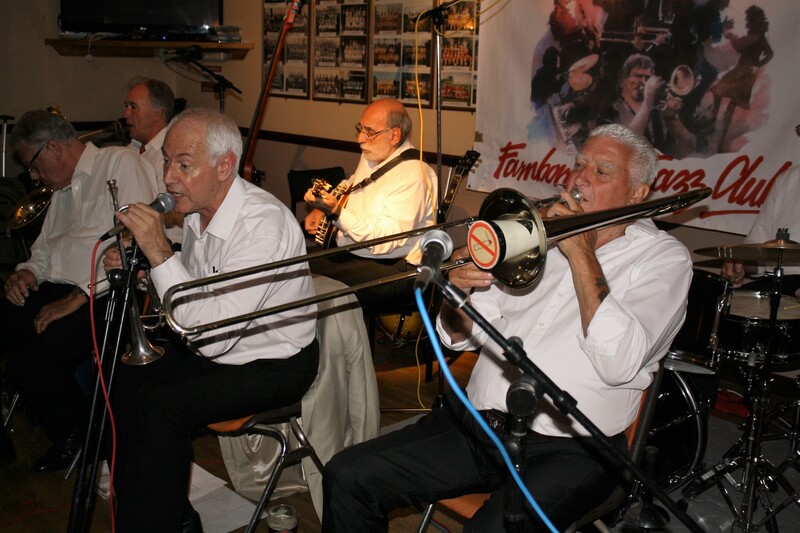 Lord Napier Hotshots play at Farnborough Jazz Club (Kent) on Friday, 29th July 2016. 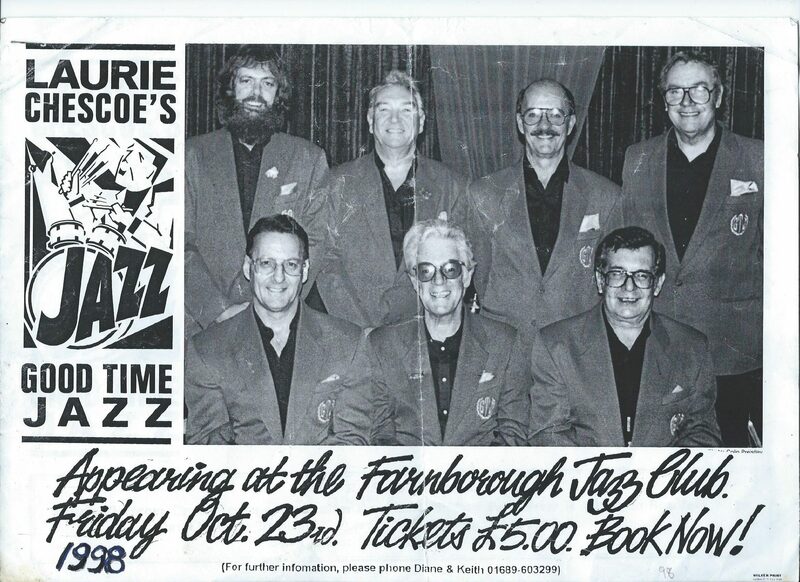 (LtoR) Mick Scrivens (bass sax), Pat Glover (clarinet), John Stuart ( banjo), Mike Jackson (trumpet), Mike Duckworth (trombone&fab socks) and Bill Traxler (drums). Photo by Mike Witt. Last week, I said these guys have played together for so many years, obviously showing they have a feel for their music – good old traditional jazz to dance and drink to. So you obviously all agreed with me and some of you even turned up before we had set up – lovely enthusiasm thanks. Here’s how the evening went. They began with a happy little number called ‘All I Do Is Dream Of You’. I remember Gene Kelly singing this one and was surprised to read that the film negatives of ‘Singing in the Rain’ were destroyed in a studio fire in 1978, although prints of the film survived, thank goodness, it is one of my all-time favourites. I missed making notes for the next few numbers, with people arriving – even wrote ‘Chris’ sang a song (but missed writing the name of the song) and they didn’t have a Chris in the band –ha (they’re coming to take me away soon!) Oh yes Chris was in the audience!!!! 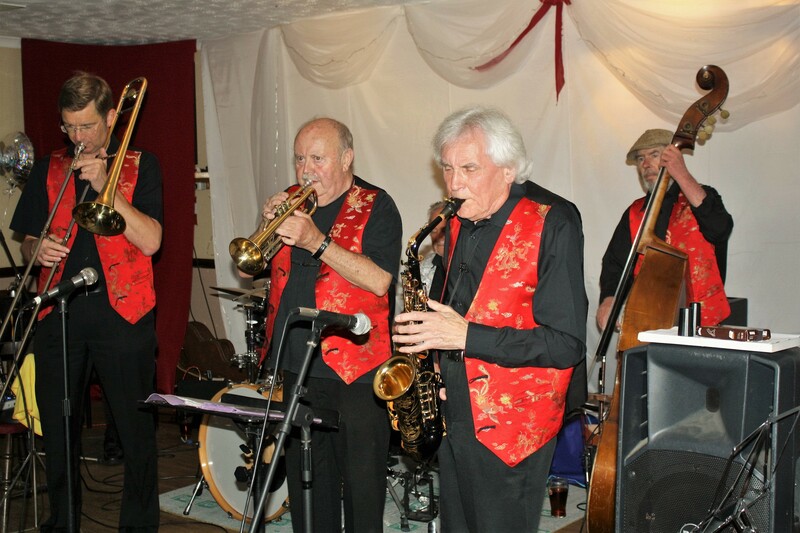 Lord Napier Hotshots play at Farnborough Jazz Club (Kent) on Friday, 29th July 2016. (LtoR) Pat Glover (clarinet), Mick Scrivens (bass sax. 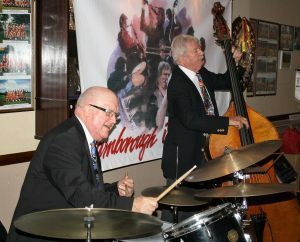 Mike Jackson (trumpet), John Stuart (banjo), Mike Duckworth (trombone) and Bill Traxler’s drums.. Photo by Mike Witt. Anyway, I did write Mike (J) sang ‘I’m Sorry I Made You Cry’, a tune that hasn’t been played here before and he sang it beautifully. Then came a good old trad’ number ‘Royal Garden Blues’ and on came the dancers. Not only did we enjoy it, but you could hear they enjoyed playing it too. We were back on the dance floor with our ‘Farnborough Charleston Line-dancers’ to the ‘Charleston’ and do we have fun – not sure if anyone finds us in their way – view-wise, ha! 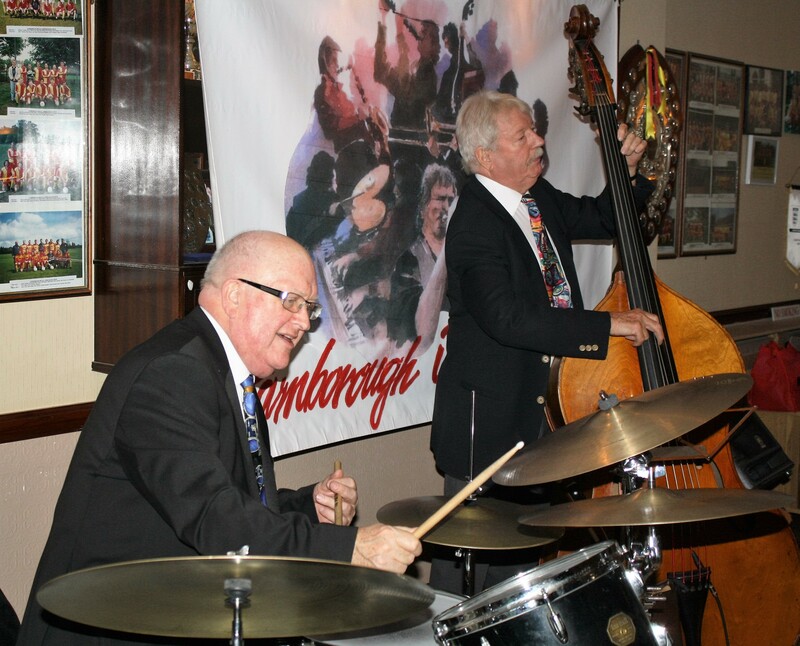 Mike Duckworth plays muted trombone accompanied by Bill Traxler on drums. Seen here playing with Lord Napier Hotshots at Farnborough Jazz Club on 29th July 2016. Photo by Mike Witt. 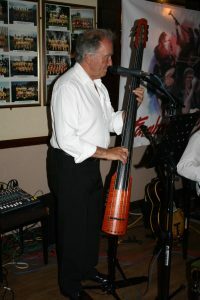 Mick Scriven plays his Ned Steinberger electric upright 5 string bass, seen here at Farnborough Jazz Club, playing with Lord Napier Hotshots – 29th July 2016. Photo by Mike Witt. I jotted down that Mick played big bertha (bass sax) – fabulous. I gave my usual three ticks to the next number ‘Lou-i-Easy-An-I-A’, which meant they all did a lovely job with playing. It is another happy jaunty number, so again plenty of dancing. 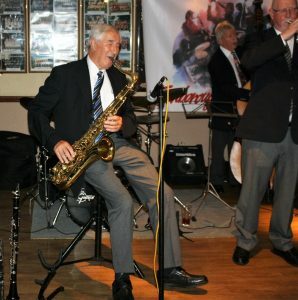 The next tune, ‘Hello Central, Give Me Dr Jazz’, must have had the dancers up too, including me because I didn’t write anything, except Mick sang and I recall he also has a great jazz voice! 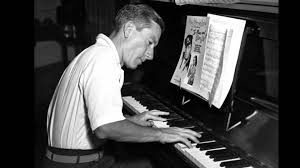 ‘Let Me Call You Sweetheart’ was another tune with three ticks, but I think I was enjoying myself, I forgot to write anything (Cinzano time, I think – ha). Then came ‘Somebody Loves Me’ and was sung by Pat who, as I have said before, has a very romantic voice and I had put my three ticks. Lovely, because again he sang the last number, being that Fat’s Waller’s number ‘You Meet The Nicest People In Your Dreams’. Oh, yes, congratulations Pam and Pat, on becoming great-grandparents again by two separate daughter-in-laws. One born lunchtime Wednesday, the other early Thursday morning! That makes eight great-grand and nineteen grandchildren altogether, wow (congrats too, to Christine, who also had a great-grandchild). 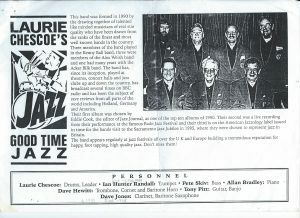 Keep jazz ‘live’ by supporting us please. This entry was posted in Lord Napier Hot Shots on August 1, 2016 by Diane.